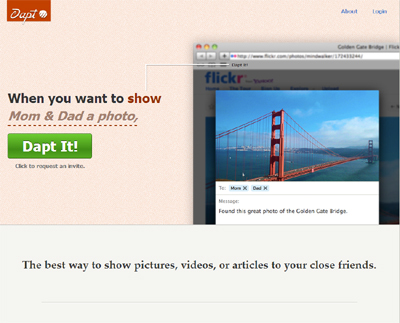 Dapt is the absolute best way to “show” pictures, videos or articles you find to your close friends. We bring all your contacts together (Facebook, Gmail or MSN), so you can send it to anybody from one single place with just a few clicks. Dapt is a really simple bookmarklet that let’s you share what you see on a page ,whether it’s a picture or a video. By pulling in all your contacts we make it really easy to send things to any of your friends regardless of the which network they are on. We also create a single page for just you and your friends to talk about it. So the next time you see something you want to show your friends simply hit the “Dapt It” button in your browser.